INTRODUCTION – New technologies such as Single Access Laparoscopic (SAL)colorectal surgeries can be can be difficult to adopt at community hospitals due to various limitations, such as cost of new instruments, credentialling difficulties, lack of trained staff, and concerns of costs to the hospital from the initial learning curve. 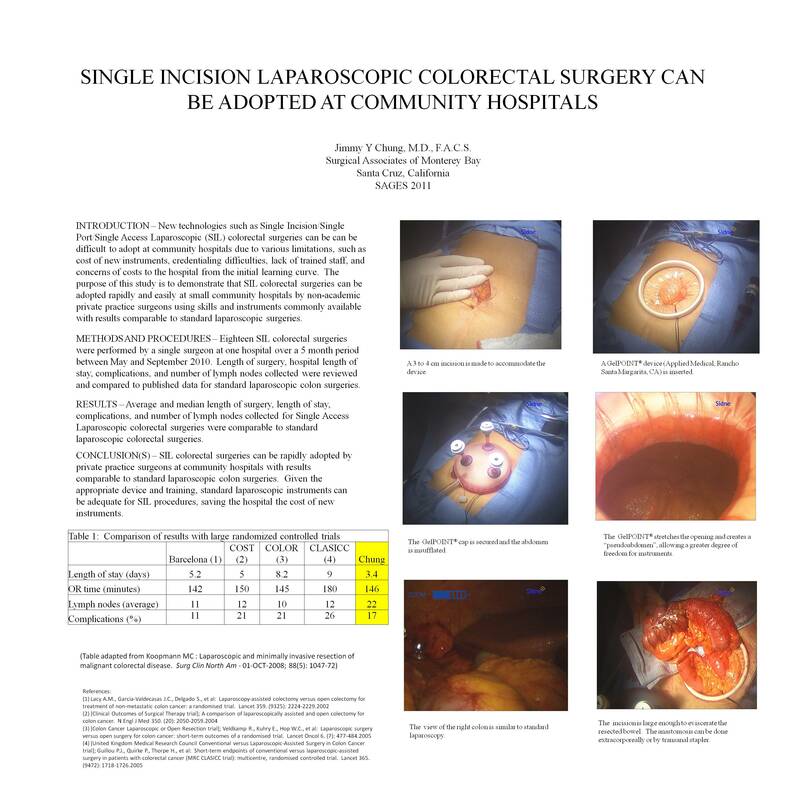 The purpose of this study is to demonstrate that SAL colorectal surgeries can be adopted rapidly and easily at small community hospitals by non-academic private practice surgeons using skills and instruments commonly available with results comparable to standard laparoscopic surgeries. METHODS AND PROCEDURES – Seventeen SAL colorectal surgeries were performed by a single surgeon in one hospital over a 5 month period. Length of surgery, hospital length of stay, complications, and number of lymph nodes collected were reviewed and compared to published data for standard laparoscopic colon surgeries. RESULTS – Average and median length of surgery, length of stay, complications, and number of lymph nodes collected for SAL colorectal surgeries were not significantly different from standard laparoscopic colorectal surgeries. CONCLUSION(S) – SAL colorectal surgeries can be rapidly adopted by private practice surgeons at community hospitals with results comparable to standard laparoscopic colon surgeries. Given the appropriate device and training, standard laparoscopic instruments can be adequate for SAL procedures. Other common barriers against adoption of new technologies can be easily minimized for SAL and should not prevent community surgeons from adding SAL to their armamentarium.